In rounds three and four of the 2016 MLS SuperDraft, conducted via conference call on Monday afternoon, Philadelphia Union continued to bolster its defense while also adding to the midfield. With the third pick of the third round, 44th overall, the Union selected 6ft 2in left back/center back Mitchell Lurie. Playing his senior year at Rutgers, Lurie had 21 starts, recording 6 assists. Before Rutgers, the former US U-18 MNT defender played his freshman and sophomore seasons at University of Portland, and his junior season at Louisville. With the third pick of the fourth round, 64th overall, the Union selected winger Cole Missimo. 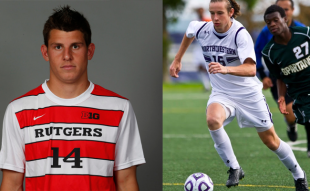 In four seasons at Northwestern, Missimo had 56 starts over 76 appearances, scoring 7 goals and recording 12 assists. In the opening rounds of the draft last Thursday, the Union selected center back Joshua Yaro at No. 2, right back Keegan Rosenberry at No. 3, forward Fabian Herbers at No. 6, and left back Taylor Washington at No. 23. BSFC crop I suspect. Missimo is a cool name I guess. Agreed, that’s a quality handle. The Lurie kid looks decent. Possible BSFC players not even convinced they make it there. At least with Lurie they looked towards size and playing on the left. Missimo from the highlights needs to work on staying wide and sending in better crosses a lot of weak balls across to the goal mouth which won’t cut it in USL or MLS. However, both could be promising if developed more if there is space for them. How/why did Lurie play for three colleges over his four year career? was wondering the same thing. seems odd for someone good enough to be an MLS prospect to have bounced around like that. Seems odd for the NCAA to allow it. I know a few guys who bounced around a bit while wrestling for one reason or another. So it does happen. Was growing into things at Portland going from 3 starts his freshman year to 13 in his sophomore year then looked to jump to a bigger program at Louisville but couldn’t break into the lineup only seeing 5 games as a sub so then jumped to Rutgers.